"Evokes compassion and empathy while also rejecting the narratives that either depict homeless youth as helpless victims or dehumanize them as deviant threats to social order. This documentary is at once heart-wrenching, enraging, and inspiring." "A powerful look at the non-academic challenges that some teens face while trying to complete high school. Recommended." 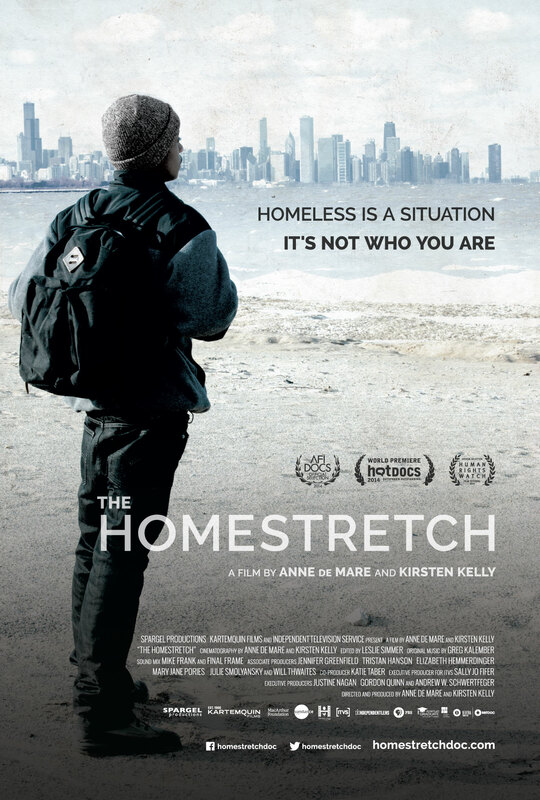 The Homestretch is a high quality film that provides a broad perspective and rare look into the world of three homeless teenagers struggling to obtain what most take for granted. The basic necessities like food and shelter don’t come easy for the thousands of homeless youth living in Chicago attending public schools. The film is an incredibly important documentary that exposes the barriers to homeless teens struggling to graduate from high school desperately wanting to live better lives. While the film can be difficult to watch, it realistically provides answers to the how and why. The DVD is highly recommended for older audiences and most libraries. It is also a great resource for anyone with an interest in researching the LBGTQ perspective. — Educational Media Reviews Online. “Directors Anne De Mare and Kirsten Kelly persuasively indict America's failure to assist homeless teenagers, which a title estimates at 1.6 million people. Yet the stories they present are genuinely uplifting, charting the lives of three homeless Chicago teens as they find housing, complete their high school educations, and ready themselves for the adult world." “An unstinting look at the reality... It doesn't exploit its subjects. In fact, it films each in such a way that you feel very protective of them." “Its intimacy is a reflection of its compassion and its brisk directness is in the mode of a police bulletin: this situation is a problem, the viewer has to multiply Roque, Kasey, and Anthony by a thousand to understand how big the problem is in just one American city." "This is an important film that people need to see... It's very heartbreaking, but it's also very inspirational... five minutes in, I was a wreck. It's a great story, a great film." "The directors of the film, Anne de Mare and Kirsten Kelly, give visibility to an overwhelmingly invisible population, fixing the camera’s gaze on homeless youth." "This school year, I would love to say, was the year Chicago got behind its homeless students and the organizations that support them." "One of the year’s best and most vital documentaries." "What is most special about The Homestretch is that it puts a voice, a face, a family and a community to the national crisis of youth homelessness. It humanizes the over one million homeless youth in our nation." "The Homestrech is not a whimsical documentary about kids. It is an honest and intellectually challenging look at the underbelly of American poverty and privilege, which succeeds in growing viewer empathy without ever becoming preachy or forceful with its message." "An inspiring documentary about homeless inner city children that exposes an under-discussed American epidemic and the strength of the human spirit to persevere where society fails." "The difficult plight of three homeless teens in Chicago is the subject of this intimate documentary that provides an unsparing look at poverty and its human cost. While systems fail, these inspiring individuals seek a better life." "The documentary dispels traditional myths about the youth homeless population." "Where The Homestretch most succeeds as a film lies squarely in its authentic, no-frills portrayal of what it means to be young and homeless in America." "A great and inspiring documentary that everyone should see, especially Chicagoans." "The Homestretch is ultimately a humane accomplishment, very much in keeping with a sentiment expressed by a worker from Chicago's Teen Living Programs to a room full of displaced kids: '[Homelessness is] a situation. It's not who you are.'" — Danny King, The Village Voice. "The devastation of watching these kids is realizing how much they have to give. Their lives are as valuable as mine, or yours, yet due to circumstances, they are given little-to-zero agency over the outcome. Our society operates on money, education, privilege equating access, whereas Roque, Kasey and Anthony are fighting for something as basic as wanting or needing shelter, a place to call theirs." "With four years of filming put into this project, directors Kirsten Kelly and Anne de Mare have created a compelling narrative with great care taken to allow Roque, Anthony and Kasey to tell their story." "Brutally honest... An important, and heartbreaking film." "The courage and conviction of these three teens defies stereotypes in this story of struggle and triumph." "One of the best films to ever be made about the stigma of homelessness, Anne de Mare and Kirsten Kelly’s transcendent, thoroughly objective, look at three Chicago teens forced to grow up too fast is heartbreaking and inspiring in equal measure without manipulation of the audience." "The Homestretch will be an amazing and important film with the potential to change the way we think about the problem of youth homelessness."